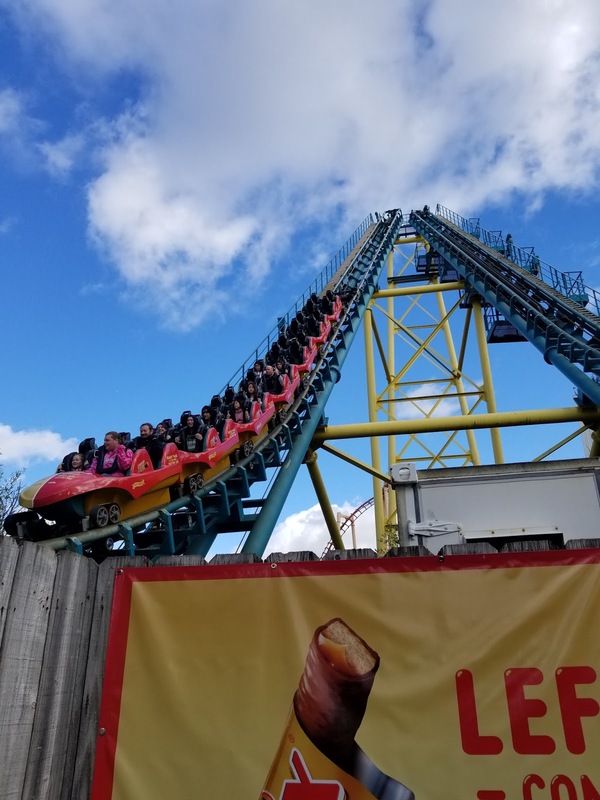 Just a few weeks ago we had gone to Six Flags Discovery Kingdom for some winter coaster action and faced some of the "off season blues". 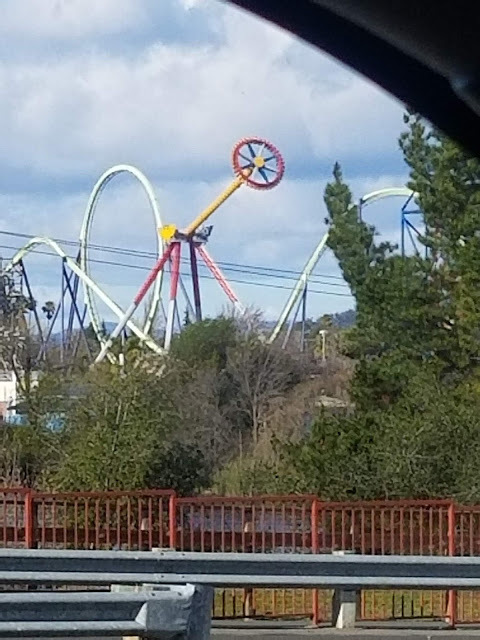 Unfortunately, it SFDK still feels very limited op with numerous closed major attractions for their winter rehab and Kong still being closed since summer. Vertical Velocity is not down though due to mechanical issue or rehab as it had just gotten out of its rehab. It appears that a repainting could be happening as we had seen that the track had been power washed, and flecks of paint all over the queue. Primer has been painted on some of the supports in the station area. Superman seems like it just got out of its rehab but has been closed once again. This left only Joker, Wonder Woman, and shockingly, Harley Quinn operational. Let's talk about what was running. Joker is still running single train op but unlike our visit in December where we waited 3 hours for it to open, it had only opened a half hour after the gates opened (along with everything else, unfortunately, more on this in a bit). We were the first riders of the day on it, running pretty smooth but lethargic due to the cooler temps. Was a good "comfort ride." 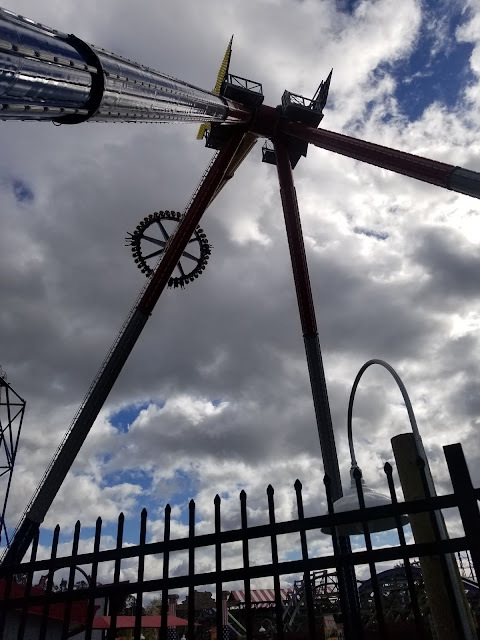 I decided to give Harley Quinn a second chance after an unpleasant first ride on it late summer. Needless to say, today's ride was only a "courtesy ride" and will likely skip it on future visits. The concept is cool. The execution however was not so good. I had opted to face backwards and was probably the worst possible decision as my head jostled about. Ride felt about as rough as Kong. Wonder Woman and its extended cycle...left many feeling ill when getting off. Next up and last ride in the Joker plaza was Wonder Woman. This is the ride that turned us seasoned riders who have been on this several times into chumps as the ride was running some kind of "extended cycle". We are used to it doing about 4-5 swings at its max height but we had watched cycles after do between 12-16 "high swings." Wonder Woman is an already intense experience, and this turned the intensity up significantly leaving us feel ill for pretty much the remainder of the day. We aren't quite sure what was going on with Wonder Woman and why the cycle was extended significantly. This was after a few weeks ago, the ride cycle came to a close after swinging just past the 90-degree mark. 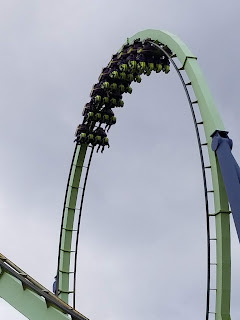 Today, the ride had gone from shrieks and whoops of enjoyment to riders being very quiet, likely feeling like us as we had also become very quiet after that 5th swing wondering what was going on. I guess we got a little more than we bargained for? as we waited for help to arrive. Had seen 5 swings once, 12, 14, and 16 many other times, 12 being the most common. 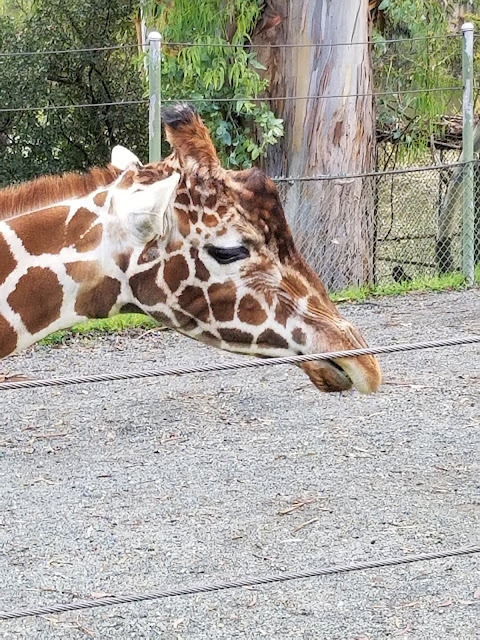 Can't pass up seeing the animals, one of our "mid-day"
One of the often overlooked areas on our visits are the animal areas so we had made it a point to go and say hi to SFDK's animal friends and let our stomachs settle. After a lap through the animals, we had though we were ok enough to go hop on Boomerang and head our way toward Medusa to round out the lap. Unfortunately, one of our party members wasn't quite through with Wonder Woman's illness and got off Boomerang leaving behind a few protein spills. Or any coaster in that matter. Definitely not the slightest bit subtle with the sponsorships. This leads to the next thing we want to bring up which is a little concerning. After the episode at Boomerang, we had decided to bring our friend over to First Aid next to the coaster to get taken care of and cleaned up. Unfortunately, the staff there didn't really seem prepared nor fit for the task at hand. Typically, in a situation like this, one would expect something to be given to an ill guest. In the end it was useless to stop by other than to grab a couple napkins to clean up the little bit of the spill on our friend's jacket. We were directed to go to the main gift shop up front to purchase some medication to alleviate the feeling. Overall, the visit to first aid was not a very hospitable experience. After this and not wanting to upset stomachs any further, we opted to end our visit early. Medusa had just gone down too as we had passed the area. We felt it was in best interest to call it and go grab a bite to eat. This is the first time ever since Medusa had opened that I had visited the park and not been on Medusa. Between its reliability issues and us feeling ill, we opted to pass on anymore rides after the Boomerang episode. So to address about park opening - this has been an ongoing thing throughout the 2018 season and has sadly carried into 2019 where rides are not opening with the park. We've seen between 30 minutes to an hour for a plaza to wake up. We have seen upset guests asking about what rides are even open as a whole section sits dormant. 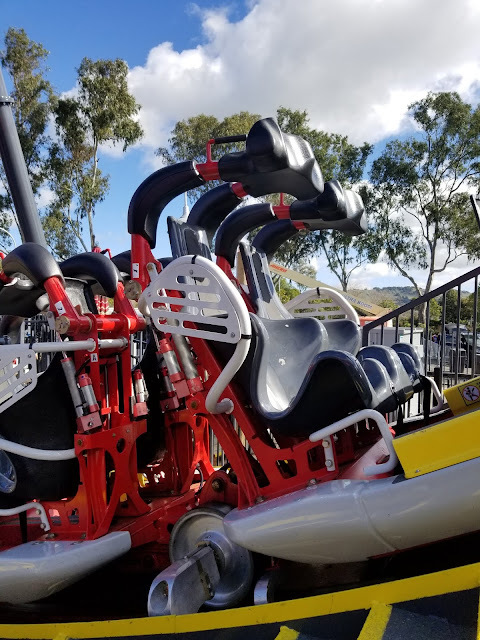 We at Thrills by the Bay do not like to highlight the negative aspects of a park but feel like an ongoing situation like this is worth bringing up. Membership early entrance is nearly useless as well. Six Flags Magic Mountain down south had made use of membership early entry and had select rides open to kick off the day, a nice incentive for partaking in their membership program. 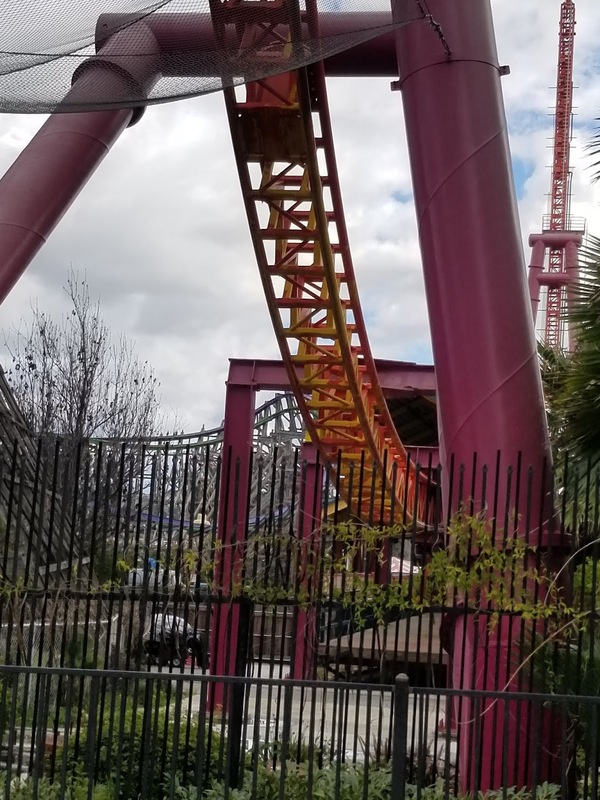 Guests paying full price (in this case, full price after city fees and convenience fees raising an online single day ticket to nearly the price of a season pass purchased during the annual Flash Sale) feel burned with a park in "limited op" mode. The further sting is felt when much of the star attractions are all down in 1 sitting. 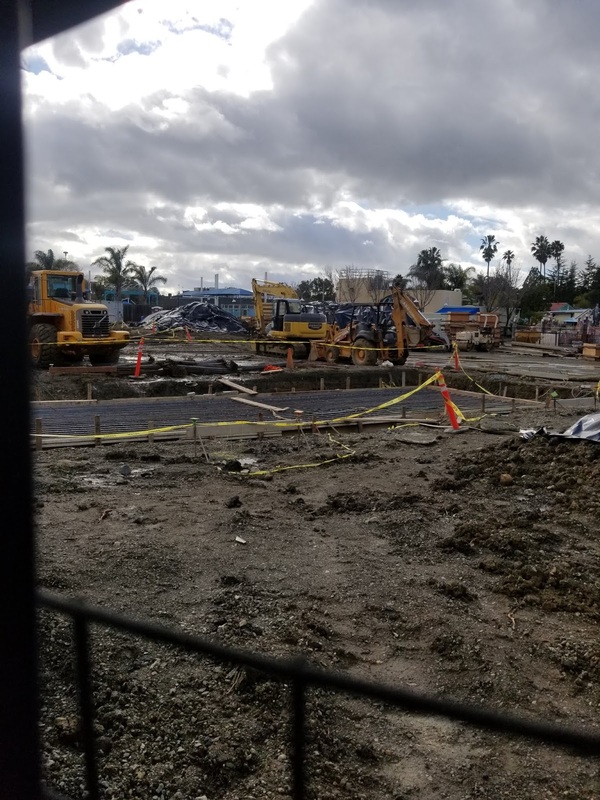 We hope Six Flags Discovery Kingdom can get themselves out of this rut that's been forming. On the plus side, the park was very quiet today and we can only imagine how successful the day could have been if there was more to offer, plus if things had opened on time. Keeping in mind, on busy days, these same things have happened leaving many including ourselves frustrated as we try to keep an open mind. 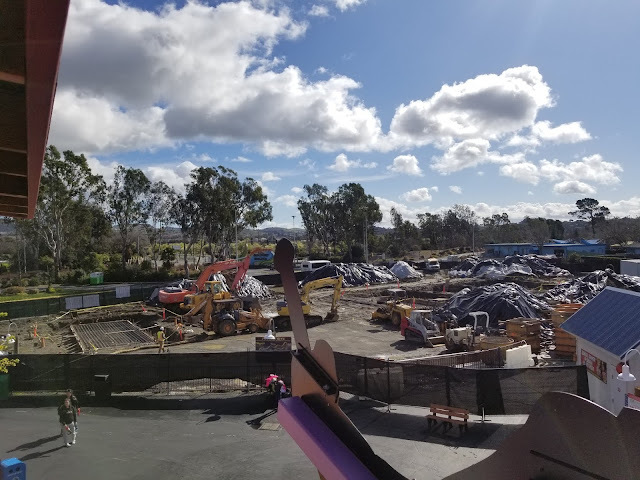 To end on a positive note - we are seeing progress at the Batman site! Track is on site (We didn't get any photos of the track unfortunately, didn't want to raise any flags snooping around in a storage area). Trenches have been made and foundations are getting prepped for concrete! We are excited to see this come to the Joker plaza after a disappointing 2018 attraction. Nice to see progress on our way out! Hope these upcoming storms don't hinder this project too much. View from Joker's station - lots of dirt has been pushed around, rebar and framing set up. Last time it was just a vacant plot. We hope to be back again soon to follow up on progress and hope we can see better operations for this park!